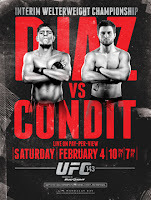 Diaz vs Condit UFC 143 Fight Pick and Preview | MMA Fighting Events Videos Techniques UFC Fight Picks and News. Nick Diaz is facing Carlos Condit in the main event this Saturday, February 4, at UFC 143. The UFC Interim Welterweight title is on the line and the winner will face George St. Pierre (GSP)to unify the title when GSP returns from injury. Let take a look at the fighters, and then I'll make my pick for this fight. Carlos Condit is coming into this fight at UFC 143 riding a four fight winning streak, all in the UFC. Condit finished his last three fights with either a KO or TKO. He definitely knows how to throw chingasos with power! Condit has an overall record of 27-5 with 26 of those wins coming via submission or KO/TKO (13 submissions, 13 KO or TKO). His propensity for finishing fights with chingasos, wrestling and Jiu Jitsu has propelled him into this fight with Nick Diaz for the UFC welterweight belt. Nick Diaz is riding into UFC 143 on an 11 fight winning streak. His last loss was back in 2008 to K.J. Noons. That fight was a stopped by the doctor due to a cut. Diaz has since avenged that loss. His loss before that goes way back to 2006 where he lost a decision to Sean Sherk. Let's let the record reflect Sean Sherk was busted for using steroids about a year later. With the exception of a cut, and losing to a fighter that was busted for using steroids, Nick Diaz has done nothing but win for almost six years. He's developed an extremely effective way of throwing chingasos, some have dubbed it the "Stockton Slap". The "Stockton Slap" coupled with great Jiu Jitsu, has given fighters all kinds of trouble and have made Nick Diaz the fighter to beat at Welterweight. Carlos Condit is a good fighter, he has all the tools to win and be a champ, but with Nick Diaz standing in the way, Condit is going to have to wait. Diaz has more experience, he's fought tougher competition, and has fought in the biggest MMA promotions and events. Diaz can undoubtably handle the pressure of the limelight, the fans, and the pressure that fighters standing in front of him can dish out. Look for the fight to be close early. As the fight goes on, Diaz's "Stockton Slap" will begin to annoy and confuse Condit. Condit is a tough fighter and will hang in there, but Diaz will be able to grind out the fight. Diaz might even possibly finish Condit, if he can pressure Condit enough, and force him into making a big mistake. UFC 143 Diaz vs Condit is going down at the Mandalay Bay Events Center in Las Vegas, Nevada. If you haven't seen it, check out the UFC Primetime: Diaz vs Condit video. 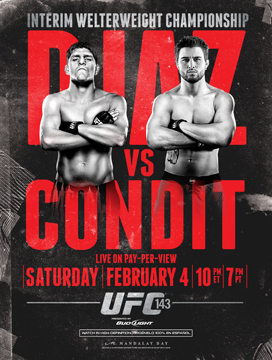 Do you agree with my fight pick for UFC 143 Diaz vs Condit?